Home / Christina Moss Naturals / Skincare for All! Skin types and conditions vary widely from person-to-person, therefore more than one way to approach skincare is necessary. A person’s appearance, specifically their skin, face and neck are focal points to first and lasting impressions. Stay positive and once solutions are found, keep it up. Don’t drop what works. Hopefully, the information below will help shed light on this topic of skincare. This is a summary of knowledge we have accumulated over time, taking care of our own skin and helping tens of thousands of customers along the way. Consequently, one might learn a thing or two. Enjoy! We are asked repeatedly if a particular product will work for someone’s skin. A woman or man might ask, “I have dry skin, will this moisturizer work for me?” In most cases the answer is, Yes. However, it can depend on a variety of factors. Due to those factors, a new product can have a single ingredient that blows the whole deal. A product that might have been a good fit is used or applied incorrectly (not as directed) and without realizing that is the problem, gives up on it too soon. It is recommended to perform a patch test before regular use of any product; simply apply / use as directed on a small area of skin that won’t be obvious, just in case an ingredient causes a reaction. If a reaction occurs, do not be surprised; simply discontinue use. Treat skin well by choosing products and a daily routine for morning and night skincare that works best for one’s specific skin type and present condition. Consistency is key with any skin type, consequently, the best skincare routine will not work if not performed daily. Take the time every day and it will show. Paying a little more attention can really payoff long-term. When skin improves over time, change the skincare routine accordingly. Changes in, or worsening of, diet or exercise, climate, life and work situations, sleep and medications can take a toll on skin. Taking better care of your skin, at these times, can minimize the negative effects. Diet, exercise, the right skincare products, and routine all contribute to that youthful skin glow. Using products that properly hydrate can minimize the onset of fine lines, creases, and wrinkles one gets over time. Another way to contribute to a youthful appearance is with exfoliation. Most skin types will do well from regular, gentle exfoliation. A washcloth, an exfoliating sponge, a gentle scrub, mask, or fruit peel, depending upon what your skin will allow, can work very well (certain skin conditions like sensitivity, rashes, breakouts, or broken skin can restrict exfoliation. Wait until broken skin heals to exfoliate those areas.) Most people can use a gentle washcloth when cleansing to exfoliate properly. Consult a dermatologist or qualified health care provider, or aesthetician for questions or concerns. This is the low-maintenance skin type that other skin types envy. It isn’t dry or oily or sensitive. It doesn’t break out (usually). 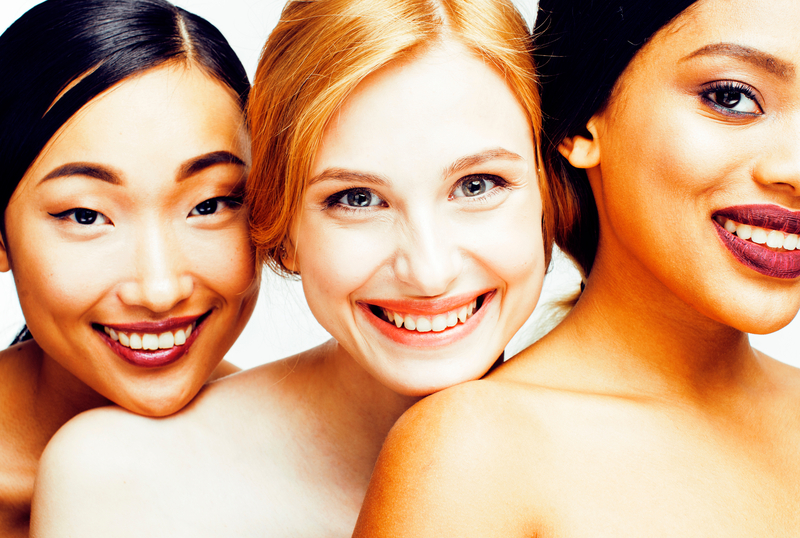 Normal skin types still require good care, nonetheless. Skin can worsen over time, and change from one skin type to another less manageable one. Therefore, care for it well. The normal skin routine: gently cleanse, with a washcloth and pay a little more attention to the T-zone, the forehead, nose, and chin. Use a good toner and moisturizer. Monthly, or as desired, use an exfoliating product or tool to keep the skin smooth. Higher-maintenance skin that is tight, parched, uncomfortable, flaky, or even “ashy,” needs gentle care. Dry skin can be painful at times, during winter seasons and in windy climates, it is harder to keep dry skin hydrated and protected from the elements. Research has found that enough water and healthy fats in a person’s diet can help with dry skin, to balance the level of hydration. Lack of hydration and proper skincare can make a person’s face and neck appear older than it should. We’ve found that using cooler water when cleansing, and particularly when rinsing off any kind of product from one’s skin, helps to protect skin from drying out due to heat. Over-cleansing should be avoided, so ensure your cleansing product and the amount used doesn’t make skin feel tight or dry when rinsed off. If it does, use less product or replace it with one that leaves skin feeling clean. Pat dry only to leave skin dewy. When using a toner, ensure it isn’t an astringent, which is better suited to oily or combination skin (for oily areas). Begin with the drier areas of the face, neck and décolleté when applying moisturizer. Using upward motions, apply all over skin and lightly massage in for complete coverage of face and neck. Exfoliating with a gentle washcloth, or exfoliating product suited well for one’s dry skin helps remove the dead skin cells that are a barrier to hydration. It’s surprising how much it improves skin’s condition and texture. Very dry skin could use a weekly moisturizing mask. There are many do-it-yourself recipes online that call for ingredients found in the kitchen. If appropriate, one can add a small amount of a high-quality and skin-friendly oil to one’s moisturizer when applying; specifically, this is helpful at nighttime and during the colder or drier months of the year. Areas to focus on for moisturizing are: the middle and sides of the neck up to the chin, the outside border of the face where the ears start, around the mouth and lips, under the eyes, in between the eyebrows and the sides of the forehead. Using upward and circular motions. ily skin attracts dust, dirt, and fine debris from the environment. Pores need to be clean, otherwise they clog and breakout. Oil, dirt, and dead skin cells mix to make a recipe for skin disasters. Keep oily skin clean to prevent rash-like breakouts or skin conditions that are unpleasant. Not cleansing and properly maintaining skin allows bacteria to have a field day, for oil-prone skin. Skincare needs to be on its toes with this type. Gentle and complete cleansing on a routine basis is necessary to help improve this skin type. Avoid over-cleansing, as this can over-stimulate oil glands. Do not avoid moisturizing because it causes tightness and dryness. This sets the oil glands into production again. After washing, toning, and moisturizing, one can blot shine-prone areas with a slightly damp towel to ensure any excess oil is gone before leaving the house. Find a lighter moisturizer that sinks into skin easily and lasts throughout the day without tightness, or an added sheen, if possible. Deep cleaning, using an astringent toner or exfoliant, is beneficial because it helps to remove what is lurking under the surface before it becomes an issue on the surface. But only if washing with a facial cleanser and washcloth isn’t enough. The nose, chin, cheeks, and forehead need the most attention. Schedule a good facial (including extractions) to aid in properly maintaining skincare, as needed. This high-maintenance dual-personality skin is a challenge to care for, but it can be easier when keeping the routine simple. The best tips are to use both routines for Dry Skin and Oily Skin, as given above. Keep the oily skin clean, the pores clean and small; be gentle with the drier areas (no astringents), focus moisturizing with the drier areas first, and wash & rinse with cooler water. Exfoliate on a regular basis for a cleaner, smoother texture all over. Do not over-cleanse, use a good facial wash and use the right amount for one’s needs. This skin type is hard to find products for with varying reactions occurring such as, redness, itchiness, bumps, breakouts and more. A good starting point is to be gentle and caring with the face, neck and décolleté. Treat them very well. Using soft materials, avoiding abrasive or highly acidic / alkaline products, and gradual introduction of new products will help. Testing new products is an ongoing trial and error, with hours wasted and dollars down the drain, in the search for products that one can live with and use every day. Introduce one product at-a-time on a gradual basis, using less than the usual amount at first. Perform a patch test with any new product to see if a reaction will occur, on an area of skin that is out of sight, before regular use. Start by using it only in the morning at first, once it passes the patch test. Do not continue use of a product if a reaction occurs. Don’t risk worsening skin conditions for any reason. So, always be gentle on sensitive skin and allow it to heal after any reaction occurs. If a person with sensitive skin uses two or three or four new products and then has a reaction, it will be difficult to know which product to eliminate. It’s no wonder people with sensitive skin have a challenging time with skincare. Use cooler water for rinsing skin and rinse enough to remove all of the cleanser without leaving behind any residue. Of course, we recommend natural skincare products. Skin types that are sensitive or have issues, may benefit greatly from the lack of synthetic, harsh chemical or petroleum by-product ingredients. This includes (chemical) fragrance. Laundry products with harsh detergents and chemical fragrances have also been linked to allergic reactions, as a result of unfriendly ingredients, by some professionals. If ingredients aren’t friendly to animals, plant life and air, certainly they aren’t friendly to humans. Breakouts don’t only affect teens these days, many adults have acne-prone skin, too. As with oily skin, it is necessary to keep acne-prone skin clean of dirt, excess oil, and dead skin cells. A mixture of those, along with unfriendly bacteria, is a playground for acne. For broken skin, do not use astringents, rough materials, or harsh exfoliants, peels, or products. No bathroom surgery allowed for breakouts, either. Popping pimples can leave scarring, spread oil, dirt and bacteria to other aeas of skin and make a red splotchy effect. Rather, opt to maintain clean skin. Making improvements in the products one uses, in one’s diet, exercise, and in the daily quality and quantity of sleep will go a long way. Besides, it just feels better overall. As needed, change the skincare routine to better maintain clean and hydrated skin. Use sun protection products as directed by a qualified health care provider. There are many natural mineral products on the market with an SPF of 30 or 45. Use and reapply as directed. Christina Moss Naturals products provide a full line of skincare items to incorporate into your daily routine. From our facial wash, to our toner, and two choices of moisturizers, to our eye cream and lip balms. We have skin covered, naturally. We offer a satisfaction guarantee for 30 days.